A rustic, open-paned gate adds to the intimate feel of the welcoming front porch of interior designer Mary Meinz and her husband, Al. The St. Francis of Assisi statue, a year-round fixture, stands in the warm glow of woven trees wrapped in white lights and is surrounded by bright red poinsettias. A pair of wreaths adorn the arched 12-foot-high by 9-foot-wide front doors. On Christmas Eve, the entry drive is lined with luminarias. For one Arizona family, Christmas is a time to celebrate the memories and traditions of their Midwestern childhoods. 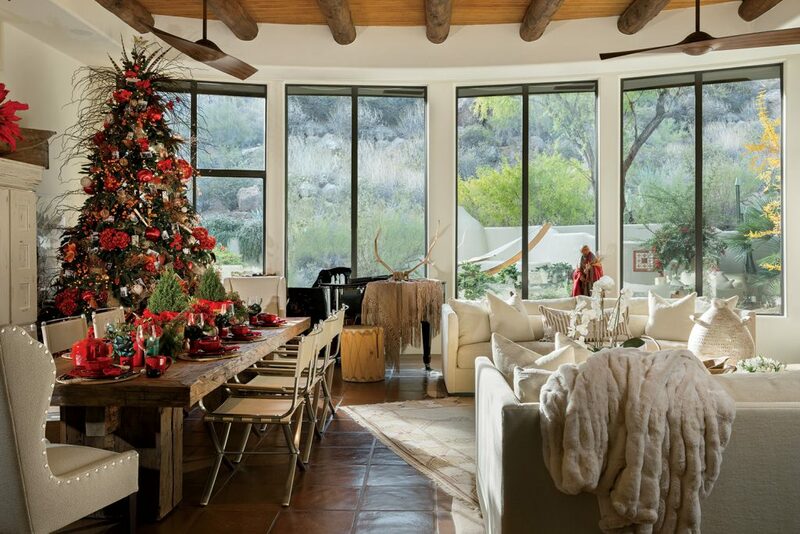 There may not be a Christmas morning blanket of snow on the ground outside the Scottsdale abode of interior designer Mary Meinz, but heartfelt personal touches scattered throughout the home transport family and friends to the warmth and hospitality of a Midwestern holiday. 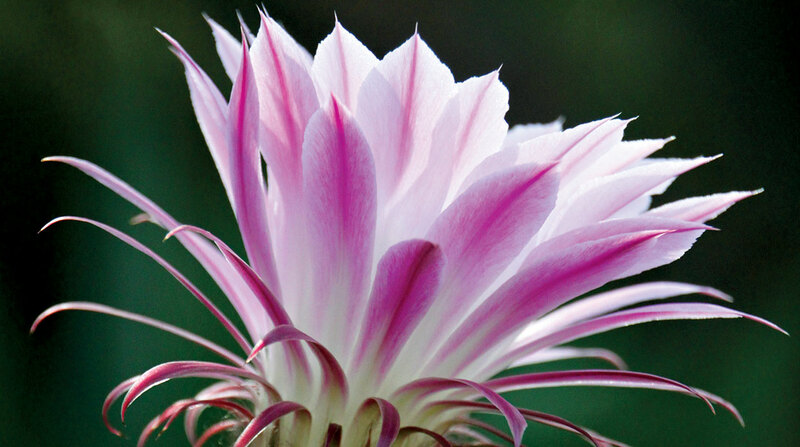 “Now that we live in Arizona, we have learned to decorate our cacti instead of making snowmen,” says Mary with a smile. 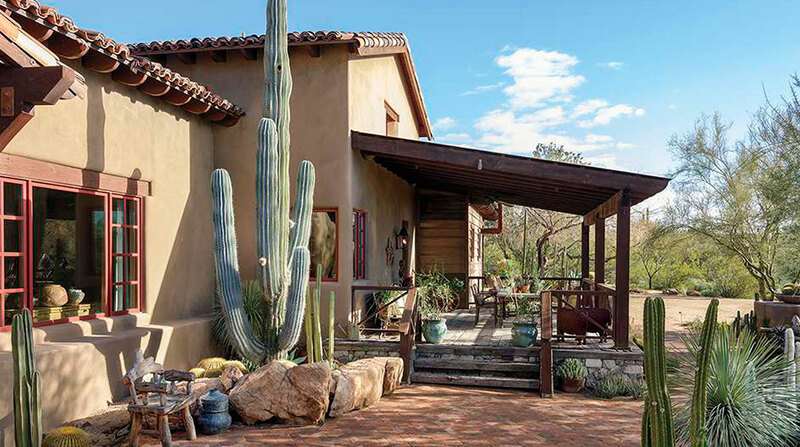 As a Phoenix Home & Garden Masters of the Southwest award winner, Mary has spent her career creating environments that reflect what her clients love. In her own house, her most deeply treasured possessions hold memories of family members, dear friends, her faith and the years she and her husband, Al, spent growing up in Michigan’s Upper Peninsula and Wisconsin, respectively. Mary has successfully incorporated the traditions of her Midwestern upbringing into the couple’s distinctively Southwest-style decor. Every year, there are two faux trees in the home brimming with memories: a large one in the living room and a tall, narrow one in the kitchen. 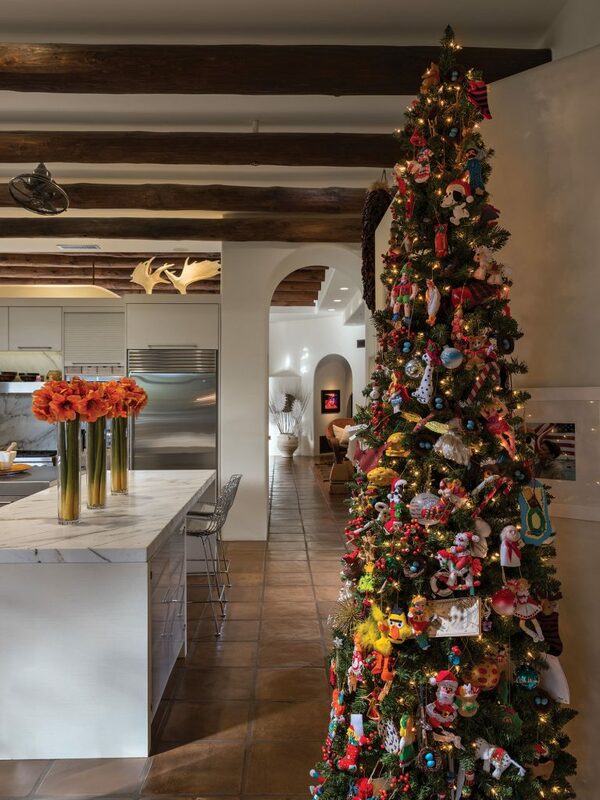 Each has a distinctive personality, with ornaments, lights and decor that celebrate Christmases past and present. 1. A rustic, open-paned gate adds to the intimate feel of the welcoming front porch of interior designer Mary Meinz and her husband, Al. The St. Francis of Assisi statue, a year-round fixture, stands in the warm glow of woven trees wrapped in white lights and is surrounded by bright red poinsettias. A pair of wreaths adorn the arched 12-foot-high by 9-foot-wide front doors. On Christmas Eve, the entry drive is lined with luminarias. 2. Christmas stockings, hand-knitted by Al’s mother are trimmed with soft mohair and personalized for each member of the family. 3. 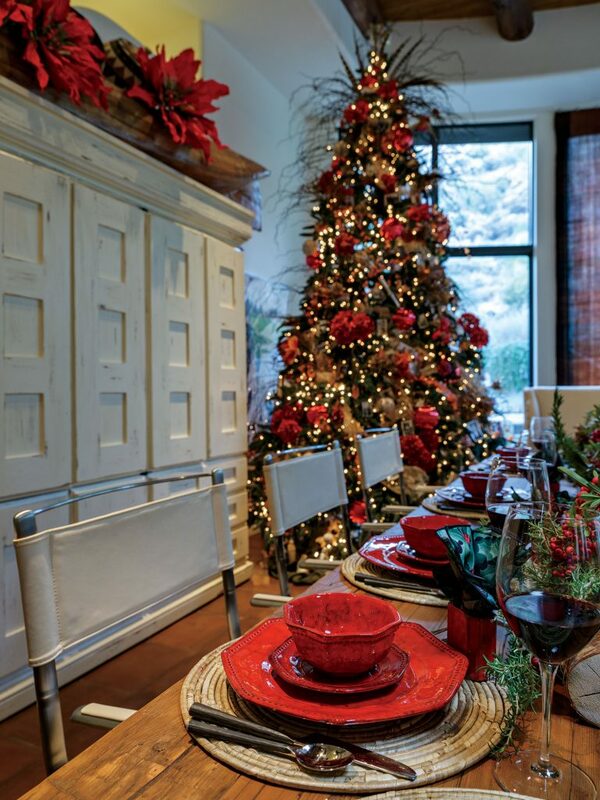 For the holidays, Mary sets the table with bright red ceramics that she purchased in 1975. The centerpieces change from year to year, just like the scenery outside the long wall of picture windows. Mary recalls a year when four mule deer with impressive antlers appeared in the backyard on Christmas Day, much to the delight of the children and adults. 4. The exquisitely sketched Christmas card with a hummingbird was made for Mary by a dear friend’s imprisoned son. “It’s on the kids’ tree forever,” she says of this treasured piece. The kitchen tree is the grandchildren’s tree. 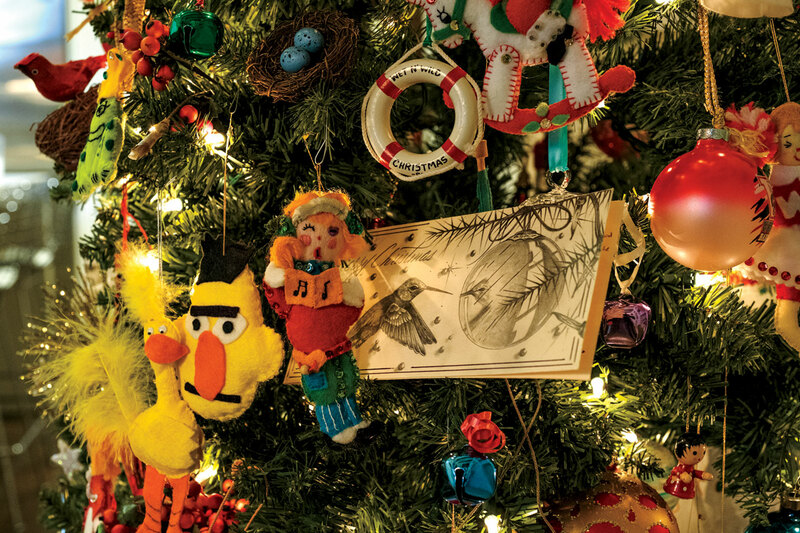 Mary and her two grandsons, Brody and Henry, decorate it together each year with Mary’s childhood ornaments, as well as handmade ones. Many were gifts to the Meinzes’ two children, Elizabeth and Bradley, from Mary’s Aunt Stella or Al’s mother. The felt ornaments, often adorned with tiny hand-sewn sequins are sweet reminders of their childhood years in Wisconsin. Ornaments that Mary and her husband have exchanged annually over their 51 years of marriage hang here, representing individual moments in time. Santa on a motorcycle celebrates the year Al got his own Harley, a life-preserver emblazoned with “Wet ’N’ Wild” commemorates happy times on the couple’s boat, and several canine-themed ornaments represent the family’s beloved Westie, Mandy. More homemade ornaments hang on a nearby pair of moose antlers that Al hauled home from a Canadian fishing trip. The formal living room tree is covered in twinkling lights and positioned in front of the room’s broad wall of windows that overlooks the landscaped yard. There’s more orange than red and green on this tree, evidence of Mary’s love for the color. 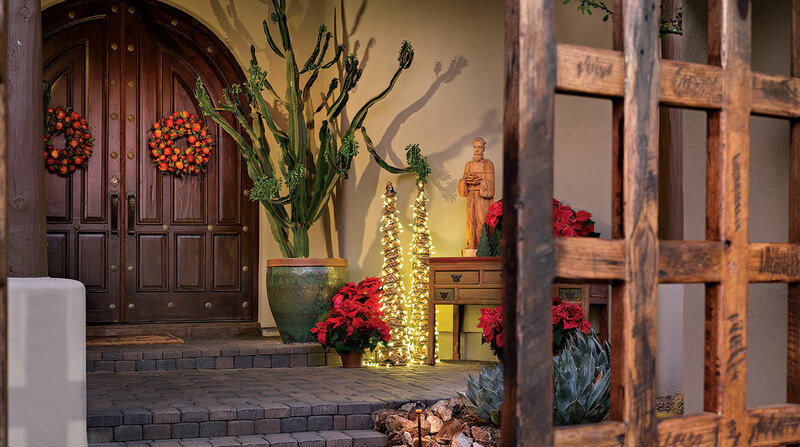 Since moving to Arizona, the designer has transformed the tree’s decor with an organic bent. Sprays of orange flowers are interspersed with feathers, birch balls, green twigs that extend and droop from the branches, pine cones and shimmering orange glass globes, and several glass ornaments that Mary has had since she was a child. 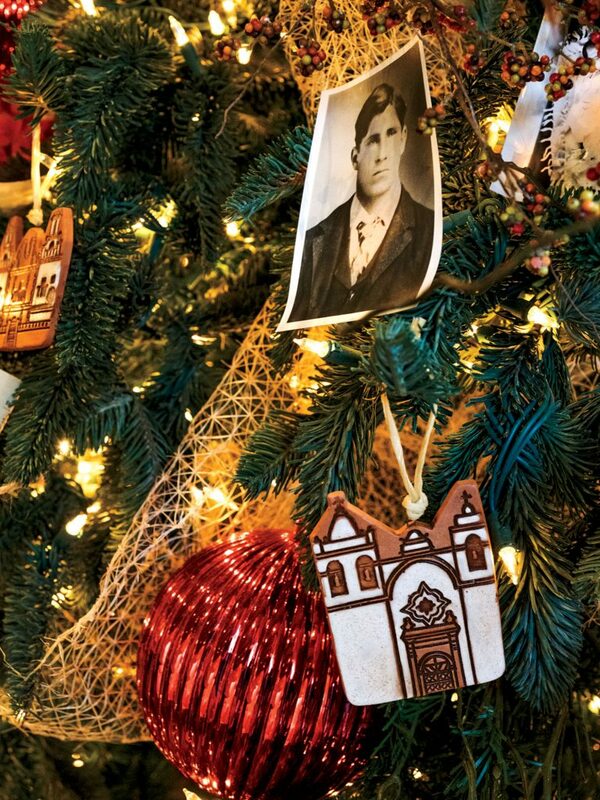 Every year, she adds something new, such as the 50 miniature adobe Mission-style church ornaments that represent the importance of the family’s faith. Scrolls tied with twine among the branches are from the grandchildren’s various performances that the couple have attended over the years. Mary also added old photos, which serve as touchstones of family history and a great way to share stories of loved ones with new generations. A 20-piece white ceramic nativity set sits beneath the living room tree. Mary handmade the arrangement in 1969 while Al was in the Army during the Vietnam War. She and her grandchildren still use his old army blankets, as well as crumpled up paper and fake snow, for its backdrop. There’s also something special about the bright red cardinals that perch on the branches of both trees. 1. A black-and-white photograph of Mary’s grandfather is nestled in the branches of the living room tree. Below it hangs one of the many adobe church ornaments that Mary and Al have collected since moving to Arizona. 2. “We group things together to tell a story,” says Mary of her tree-trimming method. 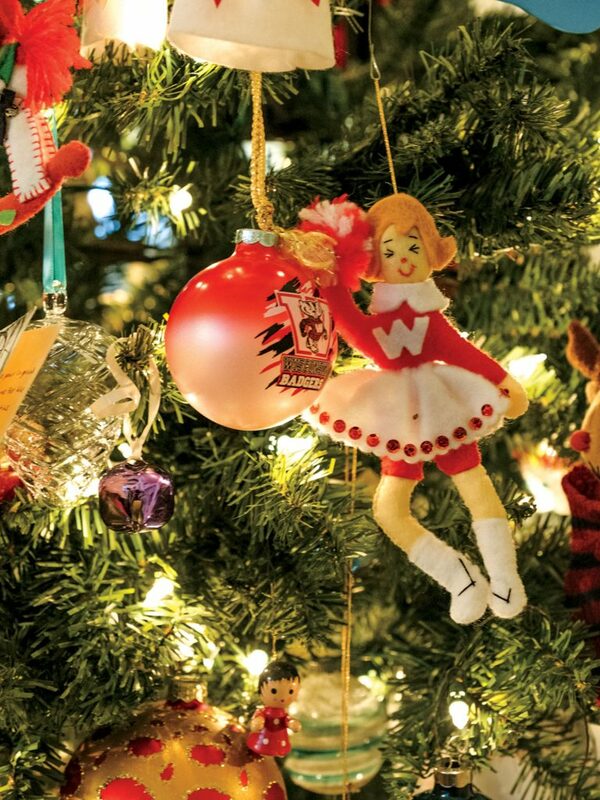 Here, a cheerleader and University of Wisconsin-Madison ball ornament pay homage to the family’s 35 years spent living in the Badger State. 3. The living room tree is brightly lit and decorated with glass globes, family photos and organic elements. The sight can be enjoyed by all who gather around the 11-foot-long dining table designed specifically for this room by Mary. The massive piece with a 4-inch-thick top weighs in at 1,000 pounds—all the better to stand the test of many years of family meals and celebrations. 4. Every ornament tells a story on the grandchildren’s tree, which is displayed in the kitchen. 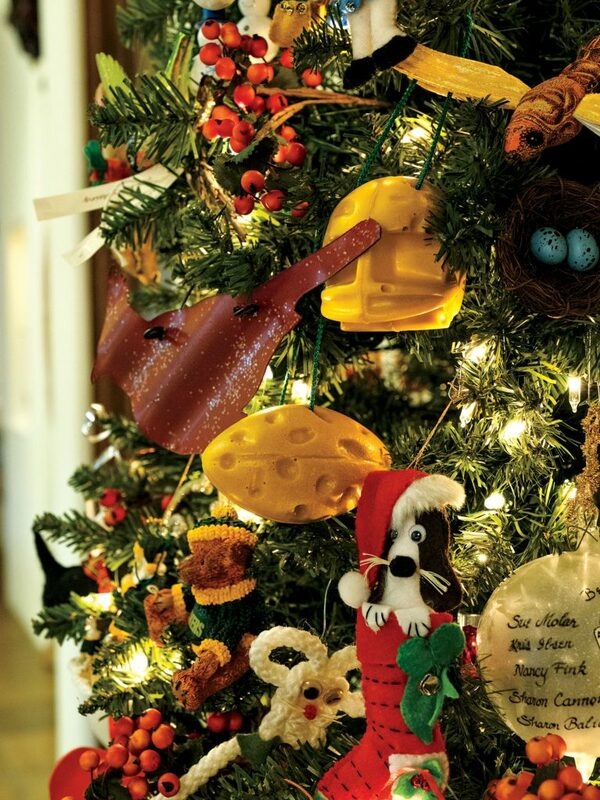 There are many nods to football team loyalties—the Green Bay Packers for these transplanted Cheeseheads—along with handmade felt ornaments. Cardinals also play an important role, as exemplified by a stylized ornament; they’re a reminder to the Meinzes of friends and family members who have passed on. 5. During the holiday season, the kitchen island is topped with colorful amaryllis bouquets. It is the site of many family baking sessions, a traditional chili party and preparation of the Meinzes’ favorite popovers for Christmas brunch. The grandchildren’s tree, bursting with memories, presides over the festivities with whimsical flair. Her table, just like her home, is a place to gather, to relive old memories and to create new ones. As much as the world may change, there are precious things that ground a family, and the joy of Christmas is a big part of what connects the Meinz family, across the miles and across generations.